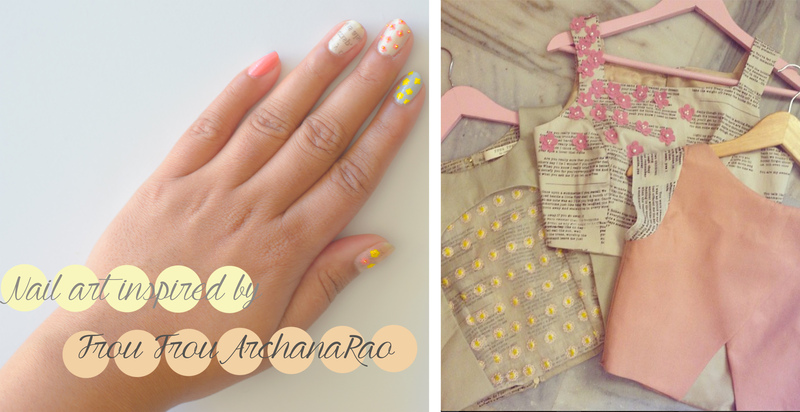 Archana Rao is one of my favorite designers currently. Her label Frou Frou is a right mix of contemporary and understated versatile pieces. When she posted a picture of crop tops on Instagram from her latest collection.I instantly loved them and thought of ten different ways to style them. To take my obsession to new level, this weekend I asked my sister to do a nail art inspired by these three muted classic crop tops. Though the process of painting these designs on nails seems long and elaborate, it is actually quite simple and the end result is, perfect manicure which make you look like you walked right out of the fashion show. Here are the steps to follow to do it yourself. Will you try this Nail Art? Please share with us your pictures either on Facebook, Twitter or Instagram. We love to see them.